Some of the most beautiful sounds in jazz are when two or more instruments share the lead, either playing the same notes or in harmony. That’s part of the approach taken by Victor Gould with his debut, Clockwork (Fresh Sound Talent, 2016). Musicians are Gould, piano and composer; Jeremy Pelt, trumpet; Godwin Louis, alto saxophone; Myron Walden, tenor saxophone; Anne Drummond, flute on two songs; Ben Williams, bass on all but two songs; E.J. Strickland, drums on all but one song; Pedrito Martinez, percussion; Yoojin Park, violin on three songs; Heejin Chang, viola on three songs; and Veronica Parrales, cell on three songs. “Room 416” is a moderate, sweeping piece. The blended horns carry the melody. Gould, Williams and Strickland are quite busy in the background. Though the title hints at something stationary, the music gives a sense of movement, perhaps a drive through the countryside. This mood is captured brilliantly by the soloists. “Room 416” is named for a Berklee dorm room that Gould shared with bassist and friend Peter Spear, who died in 2014. Louis was also a friend of Spear, so it’s fitting that he leads part of the song. “The Return” could also be titled “The Return of Greg Diaz.” It’s Gould’s tribute to trumpeter Greg Diaz, a high school friend who also attended Berklee. Gould says that Diaz experience embouchure problems at Berklee and couldn’t play for a while. “The Return” was encouragement for Diaz. Only the quartet of Gould, Louis, Williams and Strickland appear on this track, with Louis carrying the load much of the way. It’s an upbeat, head-bopping, finger-snapping song. There’s one intense passage where Gould lays down the theme, while Williams and Strickland stretch out for an extended duet. Gould says he understands that a jazz pianist might feel inclined or obligated to debut with a trio album. But Clockwork offers sextet arrangements, a quartet piece, songs complemented by a percussionist, and three augmented by a small string ensemble. “I didn’t want to be locked in with instrumentation,” he says. “I’ve come to believe that the best orchestration is when you change instrumentation very often. So you could think of that in the scheme of one piece or a whole record.” The title, he says, represents different elements working together to create something very intricate. 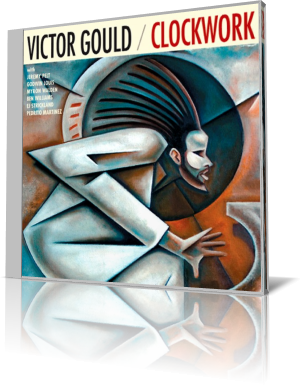 A native of Los Angeles, Gould attended Berklee College of Music as an undergraduate, and earned a slot at the Thelonious Monk Institute of Jazz from 2009 to 2011. Gould has performed as a sideman with such talents as Wallace Roney, Ralph Peterson and Eric Alexander.